← 2013: 5th of 13 Things I Want to Know: Is a Badass Look a Valid Requirement for a Spacesuit? 2013: 6th of 13 Things I Want to Know: What is the Biggest Eye Ever? Taking place in Austin, TX, the SXSW Interactive Festival Last March 8-12 2013 was to feature many sessions and activities on the topic of space exploration. 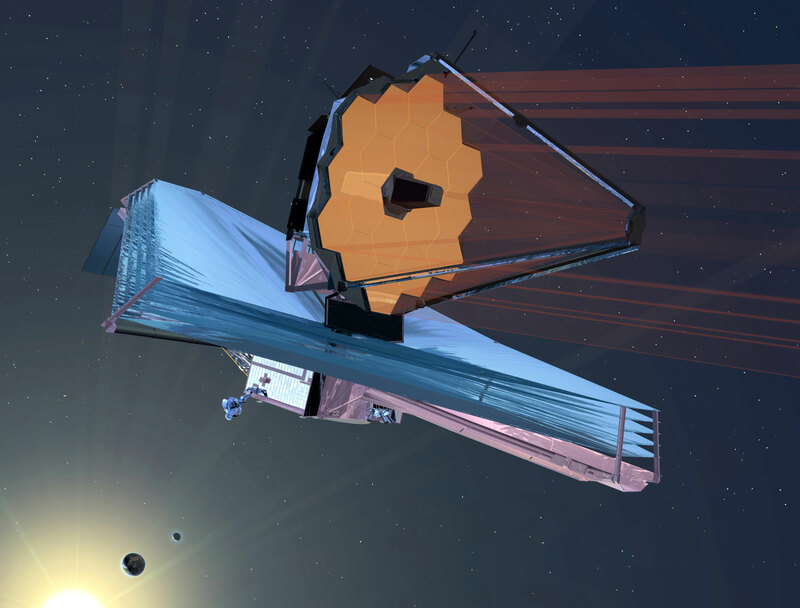 One of the most exciting sessions, was a panel discussion about the new next generation space telescope, NASA’s James Webb space telescope (JWST). In fact, the telescope was not only to be a subject for discussion, conference attendees could actually see it with their own eyes; or rather, a full size model. FULL size. This telescope is to replace Hubble. It is a collaboration between NASA, the European Space Agency (ESA), and the Canadian Space Agency (CSA). It will be 100 time more powerful, a tennis-court in size. It will be designed to answer questions for which you really need such a massive telescope, questions about the origins of the universe, the most distant galaxies, and objects that are hidden from our view. It will also participate in our continuous search for anyone else out there. It will be mainly designed for the infrared range, somewhat overlapping the visible range. This ambitious project has a target launch date in 2018. It is planned to launch to an orbit that is beyond Earth’s moon, at a distance of about 1 million miles from Earth, so that it can get better pictures of the far reaches of the universe. Maintaining the Hubble telescope presented a challenge at times, but astronauts did visit it as necessary over the years. It would probably be a bigger challenge to do the same for Webb, since it will be so much further away. There’s still lots of work to do. In the meantime you can watch the real thing under construction via web-cam. And how was it received at the conference? Well, NASA conducted right next to the model, under the stars, the world record largest astronomy lesson! As such, it officially made it into the Guinness Book of Records! This entry was posted in Astronomy, Space Exploration and tagged James Webb Space Telescope, JWST, NASA. Bookmark the permalink.